The Simpsons are going to go places. Hawaii, Cuba (several times), outer space (the good one), outer space (the terrible one), Little Pwagmattasquarmsettport—the list goes on. 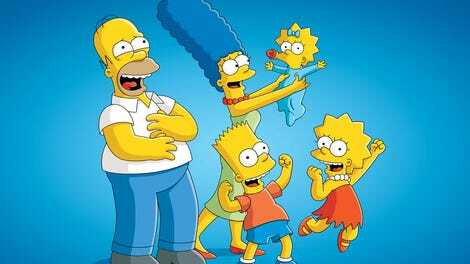 Sometimes it’s an energizing voyage, the new surroundings inspiring the characters (and their writers) to explore how the Simpson family’s Springfield routine has stunted their development as people. Other times, it just an excuse for animators’ pretty pictures and some cultural stereotypes. The question is always whether the journey has a reason that comes from character more than narrative necessity. “Heartbreak Hotel” does a fine job at supplying a motivation that—while new to us—is true to the characters. Especially Marge, whose decades-long addiction to the reality competition travel show The Amazing Place is seen to be rooted in the long Homer-less hours as a football-and-Moe’s widow. MArge explains that, while Homer has his pursuits, she has hers in the form of an encyclopedic knowledge of every hashtagged event, stunt, and twist her favorite show can throw at its grasping contestants. “You should know that, you’re a life coach!,” Marge moans at one unlucky player, sunk in the dreaded lilypad jump. Seeing their mom so energized by her expertise, Bart and Lisa team up in pestering Marge to enter along with Homer, leading to one of those lines that can still bring Marge’s role as the family’s resident stunted dreamer home hard. “You don’t miss 100 percent of the shots you don’t take,” she airily tells her kids, misquoting Wayne Gretzky in the most quietly desperate way possible. It turns out there’s more hiding in Marge’s refusal than homebody contentment however, as Bart and Lisa discover once Marge responds to their incessant badgering by snapping at them—and then revealing that she’s applied dozens of times over the years, only to be rejected. (There are boxes in the Simpsons’ attic labeled “dreams denied,” “dreams deferred,” and “dreams destroyed,” making Julie Kavner’s lonely sorrow land all the harder.) Yes, this is all just a setup to get Marge and Homer into The Amazing Place (which they do once Bart and Lisa secretly pitch her “ultimate superfan gets one last chance” sob story to the visiting producers). But that’s okay. The Simpsons are going to go places—Paris, Brazil (twice, once disastrously), Japan, even Branson. But “Heartbreak Hotel” takes the time and makes the effort to make the trip mean something. It’s appreciated. Also appreciated is how (at least at first) kind and decent everyone is about Marge’s dream, as frivolous as being on a reality show might seem. Bart and Lisa are formidable when they join forces, and adorable when the show allows them to be kids, here meshing their strengths and putting aside their differences to do something they see means a lot to Marge. (Sure, Lisa does most of the work while Bart feeds marshmallows to Santa’s Little Helper, but he views staying out of Lisa’s way as the most helpful thing he can do.) Marge expresses remorse at her outburst toward the kids, and her explanation is the sort of grown-up talk that always feels both flattering and a little frightening to a child. Even Homer, whose gluttony appears to cost the Marge-Homer team to get eliminated in record time, recognizes how badly he’s screwed up and offers to give the furious and heartbroken Marge some space. Sadly, since the show is keeping them in spoiler-free captivity in a cramped economy chain hotel for six weeks, his offer to sleep on the couch sees him worriedly lying about six inches from the still-bereft Marge. It’s a smart turn, too, to have Marge and Homer’s story veer away from what seemed headed for a tired and wacky series of satirical reality show-bashing adventures. Instead, the bulk of the episode becomes another in the couple’s series of “a searing portrait of a marriage in turmoil.” (As Homer blithely puts it, thinking the storm has blown over at the morning’s continental breakfast buffet.) The episode even jettisons the opening credits and the couch gag, presumably so that the Marge-Homer story can have some time to breathe. There isn’t even a B-story, as Bart and Lisa’s homebound adventures in being babysat (by Patty and Selma) are dispensed with in one phone call and a “digging a swimming pool” gag. Which all means “Heartbreak Hotel” should work better than it does. Sadly, the relationship story turns into a stunt. Or rather a pair of stunts, as first Homer woos Marge into the cushy, expenses-paid hotel life with a sleepy but clever-enough, hotel-specific version of the title song, and then the episode turns into an extended riff on Who’s Afraid Of Virginia Woolf?, complete with black-and-white cinematography and a guest shot from George Segal, straight from the 1966 Mike Nichols adaptation of the Edward Albee domestic drama. The Woolf is the real culprit here. As skillfully as the interlude’s Homer and Marge ape Richard Burton and Elizabeth Taylor’s acidic repartee, the sequence completely derails what, until then, had been a rather promising character duet. With Marge boozily throwing herself at Segal’s forever-young and unimpressive Nick (he and wife Honey were also expelled from the reality competition), the gimmick takes over. So when Marge ditches Homer for Nick when losing contestants are given a second chance, her decision doesn’t carry any weight, as her motivation switches from justified resentment to “the plot told her to.” Upon costing her new team a million bucks thanks to a mistake of her own in the silly final challenge (#MangoTango), Marge’s contrition, too, comes too fast and too contrived to make much impact. Watching her remorse on VHS again and again back home, Homer lords it over Marge that she messed up for once, and that he totally understands her satisfaction in being in the right all the time. 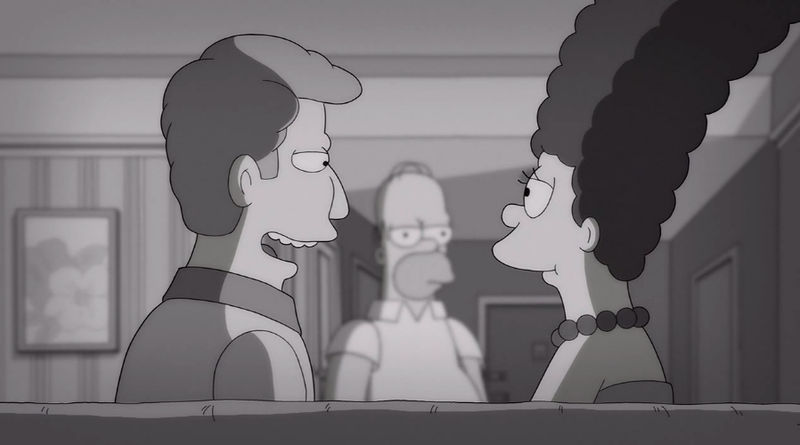 Marge’s sad “I never let myself enjoy it” drives home how “Heartbreak Hotel” squanders what looked to be an encouraging shot at finding The Simpsons’ nowadays-elusive heart-to-laughs balance. It’s a shame, really, as the high concept “The Simpsons go on The Amazing Race” synopsis seemed to promise something a lot cruder. Instead, “Heartbreak Hotel” took a shot at something different (a good thing), and missed. The music to Lisa and Bart’s scheming is “Hotsy Totsy” by Heinz Kiessling, best known as cheerily ironic counterpoint to the Gang’s darker shenanigans on It’s Always Sunny In Philadelphia. That was the very funny Rhys Darby as Aussie Amazing Place host Tad Tuckerbag. The late Sandy Dennis nonetheless appeared too, silently reprising her role as Woolf’s downtrodden Honey in cartoon form. Homer and marge watch the in-room adult offering The Anniversary Snuggle. Filling out the mountainous “amazing waivers” before going on the show, Homer signs off liability should he contract toxoplasmosis. “That’s what ate Handsome Don’s face!,” Marge exclaims excitedly.